Like other browsers, Firefox collects a detailed history of your internet adventures. If you want to cover you tracks, or don’t want Firefox to collect any data at all, you can make changes to ensure a more private browsing experience. 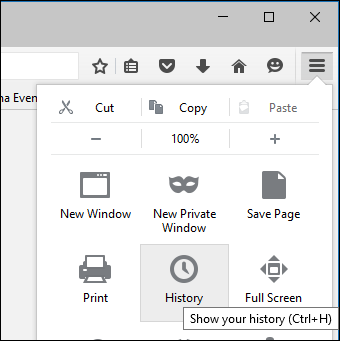 You can access Firefox’s history from the aptly-named “History” menu on OS X, or by clicking the three lines in the upper-right corner on Windows and selecting “History” (“Control + H”). Not only will the History menu display recently visited websites, but also recently closed tabs and windows. You can also display tabs from other devices and restore a previous session. The items of most interest to us however, are the options to “Show All History” and “Clear Recent History…”. When you select “Show All History”, you will see your entire browsing history laid out in a windowed list. If you want to delete any of these websites from your history list, you can select one at any time and hit the “Delete” button. If you want to delete everything, then use Command+A on OS X or Ctrl+A on Windows. If you want to select several sites at once, use the “Command” key (OS X) or “Control” (Windows) to select each site you want to remove from your history. 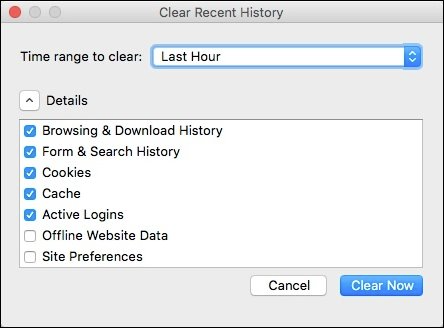 The fastest way to clear your history is to select “Clear Recent History…” from the History menu, which will give you a dialog to choose the history time range you want to clear. You have the option to clear the last hour, two hours, four hours, today, or everything. Click “Details” and you can choose far more than your browsing and download history. You can also clear out stuff like your cookies, cache, active logins, and more. If you want to set up special options for your browsing history, you need to open Firefox’s preferences and select the “Privacy” category. In the Privacy settings, there is a section devoted entirely to History. In the following screenshot, we’ve selected the option to “use custom settings for history”. If you decide to always use private browsing mode, then your browsing history, cookies, and other items will not be saved. You can also elect to not record your browsing and download history, search and form history, or accept cookies. If you don’t want to accept third-party cookies, the option is there if you elect to enable it. 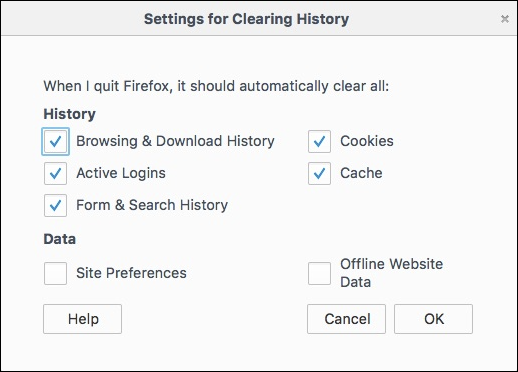 Finally, if you want your browsing history to clear whenever you close Firefox, you can select that option and then click “Setting…” to choose exactly what is cleared when Firefox shuts down. It’s important to remember that, clearing some of these items affect later browsing sessions. For example, if you clear active logins, you will have to log back into any sites from your previous session. Similarly, if you clear out your cookies, your login sessions will be deleted and you will have to reenter your credentials. 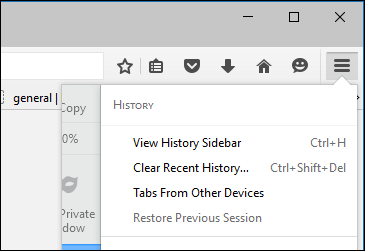 When you choose the option to clear your browsing history upon shutdown, Firefox won’t give you any warnings, so it’s important to remember that you’ve selected the option in the first place. Otherwise, you may wonder why you’re always being logged out your favorite social media sites or why your recent browsing history is always gone. Clearing your history and other private data is one of the best privacy practices you can undertake. Firefox is unique in that it has the option to clear this stuff every time you shut it down, so if you’re particularly privacy-conscious, such as if you use Firefox one a work or publicly used computer, then this is a great option to enable.